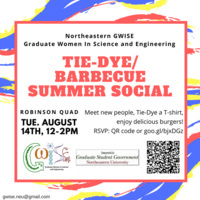 We are excited to announce our Tie-Dye/Barbecue summer social, on Tuesday, August 14th, 12-2PM. Last year's tie-dye event was a success, and we hope to meet even more new members this summer! Join us on Robinson Quad to meet our members, learn about our activities, tie-dye a free T-shirt and enjoy delicious burgers (vegetarian options will be provided). Why should you sign up? Free food, free DIY T-shirt, and delightful company!